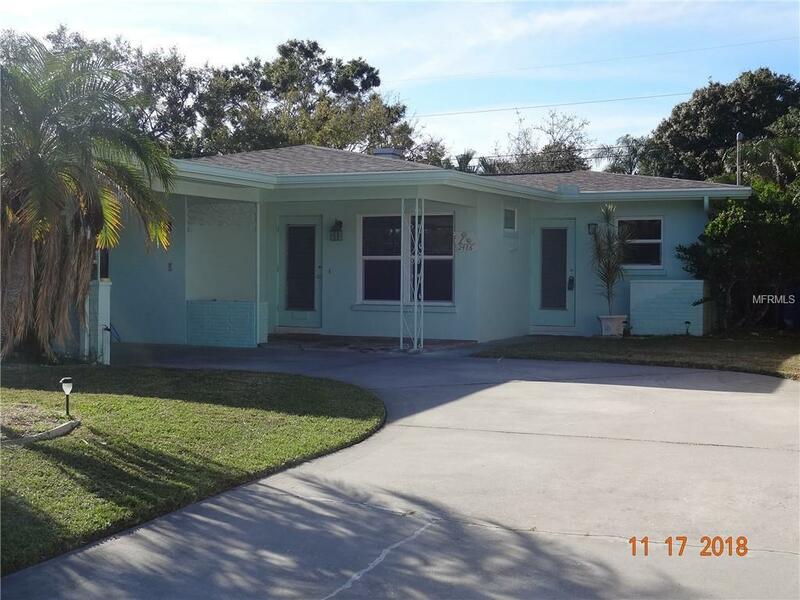 Move in Ready - 2 Bedroom, 2 Bath Block Home in the waterfront community of Baywood Shores, Dunedin, FL. Recent Upgrades to include NEW Roof (2015), Exterior two-tone Paint (2017), Upgraded 200 Amp Electrical Service (2017), 14 Seer A/C Heat Pump and Ductwork (2017), Hurricane Impact Windows (2017), New Disposal (2018). Florida room has 216 add'nal sq ft with built in wood shelving, tile floor and wall A/C w/remote control. Located walking distance to the Dunedin Causeway, Gateway to Honeymoon Island, across from the Pinellas Trail, providing accessibility to Delightful Downtown Dunedin via walking, biking, rollerblading and running. This BLOCK Home features Bamboo, Tile and Terrazzo flooring. Real Wood Cabinets in "Country Style Kitchen" w/ built in Oven, separate electric range top. Retro Bathrooms features a Tub in the Hallway Bathroom and Walk-in Shower in the Master Bathroom. Dual Built in Dressers in Master Bedroom, as well as built in storage in the Hallway. Covered Front Porch w/Flagstone Pavers and Wrought Iron Column. Extra long driveway to Carport featuring Dusk to Dawn LED lighting. Walk to Benedicts, Cricketeers n Publix. Home to 8 Microbreweries, Toronto Blue Jays spring training, weekly Farmers Market, Festivals all year round in this Tropical Paradise, easy access to Tampa, Clearwater and St Petersburg. This home is a good Solar Power candidate, once you close on this Open East/West facing Dunedin home. Let's make a deal on your new Home!